Treten Sie einer Gemeinschaft anerkannter Technologieführer mit bewährter GRC-Expertise bei und bieten Sie Ihren Kunden innovative, branchenführende GRC-Lösungen. Indem Sie ein OXIAL Partner werden, können Sie Ihre Geschäftsmöglichkeiten in jeder Branche und Region erweitern, Geschäftssynergien nutzen und einen echten Wettbewerbsvorteil erlangen. Global Data Sentinel (GDS) ist ein in New York ansässiger Anbieter von Cybersicherheitslösungen mit Schwerpunkt auf Datensicherheit, Benutzeridentitätsmanagement, Datenzugriffskontrollen und Audit-Lösungen, die unberechtigte Datenverletzungen in Netzwerk-, Cloud-, Anwendungs- und mobilen Umgebungen abmildern und verhindern. Squirro bietet eine Context Intelligence and Insights-Lösung, mit der Unternehmen Daten verwalten und umsetzbare Erkenntnisse freischalten können. Raw Labs: Erstellen Sie kein Data Warehouse. Lassen Sie RAW es automatisch für Sie erstellen. Benutzer fragen nur Rohdaten und aktuelle Daten über alle Datenformate ab. Differentiate and distinguish your business from the competition with new generation GRC solutions designed to eliminate common GRC weaknesses. OXIAL offers multiple delivery and business models. Short implementation times ensure rapid conformance to regulatory and industry constraints. Earn increasing sales commissions on sales of OXIAL product licences and services. Receive sales leads for specific sectors. Enjoy ongoing upsell opportunities (risk, internal control, compliance, etc.). Combine our GRC solutions with complementary advisory and consulting services to improve margins and create meaningful differentiation. Complete partner programme ensuring all our partners are well trained, well assisted and well rewarded in selling and delivering OXIAL GRC solutions. Joint marketing activities working closely with our partners to develop joint offers, create new business opportunities and spread the word. Together with our partners, OXIAL produces and disseminates thought leadership around current and future GRC issues, providing new ideas and insights on current and future GRC topics of interest (participation at prestigious conferences, white papers, top-tier journal publications, etc.). Whether it be pre- or post-sales support, or a technical implementation issue, our in-house teams are available to support you and answer any questions you might have. Co-marketing support in planning and running promotional events, webinars, joint communications, etc. Solid, reliable support services at every level. We hope our partner programme will fulfil both your needs and those of all our current partners, and more importantly, our joint customers. Become an OXIAL Value-Added Reseller and represent OXIAL in a specific country or region by actively marketing and selling OXIAL solutions and services. VAR Partners can leverage OXIAL products by capitalizing on their strong GRC expertise and knowledge of local markets to offer tailored personalized consulting and support services, thereby building a profitable extension to their business and creating meaningful differentiation. Our VAR partners commit to meeting established annual sales quotas and engaging in sales and functional training and certification. In return, OXIAL commits to rewarding our VAR Partners well for their sales efforts, and accompanying them to ensure that they have everything they need to increase revenue and profitability. 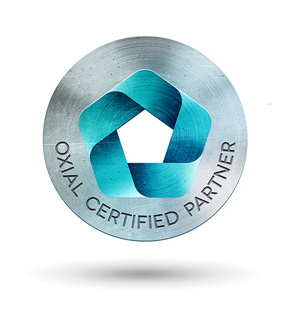 OXIAL VAR partners, as part of the OXIAL Partner Programme, are tiered into Silver, Gold and Platinum levels based on their level of investment and contribution that drive our mutual success. Based in the customer’s region, our Delivery Partners are certified integration consultants with expert OXIAL product knowledge, who use our GRC convergence best practice approach to successfully deliver OXIAL solutions that best meet our customers’ needs. Close by, our Delivery Partners accompany customers in their GRC journey over time; helping customers leverage the benefits of integrated GRC by adding multiple GRC initiatives to the OXIAL platform whenever required. OXIAL provides all Delivery Partners with extensive technical and project-based training whereby they work side by side with OXIAL resources, gaining in autonomy with each engagement. OXIAL offers a tiered programme for our Delivery Partners: Silver, Gold and Platinum. OXIAL Advisory Partners are renowned global and regional advisory firms who provide the latest best practices in Governance, Risk and Compliance (GRC), and work in collaboration with OXIAL to propose new generation GRC solutions targeted at specific sectors to help our customers to better drive their risk performance. Agents actively identify business opportunities in a particular region or country and in return earn sales commissions on all registered leads that turn into customers. You could be pitching OXIAL GRC Solutions to your first prospect or delivering your first OXIAL GRC project to a client within weeks. 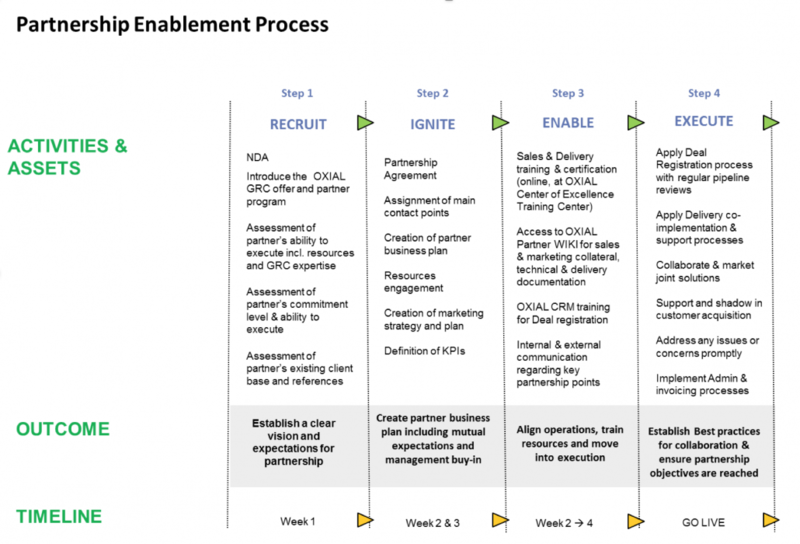 OXIAL’s partner enablement programme addresses all business and technical enablement needs for each type of partner to give you the skills you require to be self-sufficient when marketing, demonstrating, selling and implementing OXIAL GRC solutions. Training is either free or at reduced prices, due to exclusive partner discounts. OXIAL provides specific training and certification courses for all partners. Advisory Partners, Value-Added Resellers, and Agents are required to participate in the OXIAL Partner Sales Training and Certification programme. OXIAL Delivery Partners must enrol in a specific programme to acquire the skills necessary to implement and support OXIAL GRC projects. OXIAL GRC Level 1 Support. The OXIAL Centre of Excellence provides a single source of GRC expertise, allowing customers and partners to acquire the skills required to face increasingly complex governance, regulatory and compliance (GRC) challenges. Risk management, internal control, auditing, compliance, GRC IT, etc. The OXIAL Centre of Excellence is a fast paced, lively, learning environment offered as either a virtual classroom or onsite training. The expertise of our highly trained instructors, together with course materials and case studies, enables you to quickly gain knowledge and expertise you need. Scheduled courses are held at the OXIAL Centre of Excellence at locations determined by OXIAL. Scheduled courses take place monthly or bi-monthly. Attendees for each scheduled course are usually from a variety of OXIAL partner and customer organisations. To avoid attendees from one organisation dominating a course to the detriment of others, attendance of a scheduled course on any particular date is limited to five attendees per organisation. Scheduled training costs are either free (sales training) or calculated per seat per day. On-site courses are hosted at a site of your choice (e.g. in your office). A minimum number of attendees are required to book an on-site course and all attendees are generally from the same organisation. Booking on-site training should be done as far in advance as possible because lead times can be lengthy. Most courses are available on-site. Experience has shown this to be the most effective training experience. On-site courses provide the instructor with a little bit more flexibility to focus more on some sections of the course and less on others when it is of benefit to do so. On-site training costs are calculated as a flat rate per day plus travel and accommodation expenses for the trainer(s). Specific courses are available through web-based training, in particular, sales training and certification for Agent partners. Web based training courses are held monthly or bi-monthly. Costs are either free (sales training) or calculated per course/module per user. The current availability for web-based training can be found on our events web section). The OXIAL Centre of Excellence does not offer bespoke or tailored training. Experience has shown that the cost of preparing and delivering such training is not cost effective. Neither is it conducive to maintaining quality standards for training delivery, or meaningful, accurate tracking of knowledge transfer to partners. Instead of relying on OXIAL-delivered, instructor-led training, qualifying partners may make use of OXIAL train-the-trainer programmes. This enables qualifying partners to deliver OXIAL training themselves using their own OXIAL certified trainers. Further details of these programmes are available on request. OXIAL does not provide end-user training because each project is different, with different customizations, configurations and customer-specific working practices. Partners and customers are expected to organize the planning, preparation and delivery of end-user training as part of an OXIAL-based delivery project. As part of the training for Delivery Partners, OXIAL provides a starting point and guidance in preparing project-specific end-user training. Events constitute a very important part of the OXIAL marketing strategy. We distinguish between events driven by our partners, OXIAL events, and appearances at industry trade fairs where our partners can showcase their services and solutions at a joint stand. As a partner-centric organisation, it is of great importance to OXIAL to appear alongside our partners at trade fairs. At joint booths, we give you the opportunity to showcase your services and solutions in a modern set-up. Given today’s regulatory environment, growth expectations and organizational accountability standards, innovative thinking is key to providing the most effective risk management methods, content and tools. OXIAL actively collaborates with partners to leverage our experience and knowledge, bringing meaningful insights and new ideas to GRC. We invite partners to contribute to thought leadership initiatives in the form of events, conferences, articles in top-tier journal publications, case studies, etc. OXIAL works with leading editors from all kinds of relevant online and offline publications, by not only providing news about OXIAL and our products, but also offering market insight. We welcome the opportunity to work together to announce OXIAL-related projects and increase exposure. Case studies, which provide detailed information about a customer’s experience with the OXIAL solution, are a very powerful sales tool. We expect our partners to develop annual case studies presenting OXIAL related projects and how you have supported customers on their GRC journeys. These case studies may also be used to market GRC publications, events and other communications. Our marketing teams are constantly looking for innovative ideas to reinforce OXIAL’s image and brand in new and original ways. Please feel free to contact us at any time to discuss any suggestions you may have. For detailed information and specific enquiries, please contact your OXIAL Channel Manager.